ABSTRACT: The study area is located about 40km west ofAydin city in western Turkey and includesNeogene to Quaternary sediments of the Fevzipasa Formation, which unconformably overlies the Miocene rock units. The Fevzipasa Formation is composed of conglomerates, sandstones, mudstones, marls, limestones and tuff layers and is unconformably overlain by recent deposits of the Söke-Milet Basin. The lower part of the Fevzipasa Formation is represented by coarse clastics and lacustrine carbonates followed by fine to coarse-grained sandstones bearing mollusc shells. Prominent tuff layers (lower and upper tuff layers) of this dominantly sandstone succession were radiometrically dated between roughly 2 and 1Ma. Based on small mammal fauna the age of the upper part of the formation is Early to Late Pleistocene. To investigate the paleoenvironmental evolution of the succession, forty-two samples were collected along two stratigraphic sections. Ostracoda assemblages together with Chara flora, Gastropoda and Pelecypoda and fish remains were recovered from only twenty-nine samples. 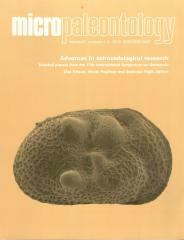 Ostracoda assemblages include Candona neglecta, Cyclocypris ovum, Ilyocypris gibba, I. bradyi, Heterocypris salina and Scottia cf. S. pseudobrowniana. Additionally, fish remains belonging to the Cyprinidae family (Tinca sp., Leuciscus sp. and Leuciscus etilius) and Characeae gyrogonites referable to Nitellopsis obtusa, Chara sp., C. aspera, C. globularis, C. hispida, C. vulgaris, Lychnothamnus sp. and Sphaerochara sp. occurred in the samples. The ostracod, fish, and gyrogonite records all indicate that the Fevzipasa Formation was deposited in a paleoenvironmental setting characterized by permanent and shallow water bodies. According to the identified Ostracoda assemblages and combining all available stratigraphic data, the age of middle part of the Fevzipasa Formation is suggested as Early Pleistocene (Calabrian).